With the World Cup and the Olympics coming soon to Brazil, tourist interest in the country's slums, called favela's, is on the rise. Host to 8 million residents, 20% of Brazil's poor, favelas were often hotbeds of gang, drug and other types of illegal and violent activity . . . till now perhaps. There is a growing awareness by the better-off of the favelas gritty music and art scene. With the scheduled global sports competitions shining a light, social and financial support from Police Pacification Units, known as UPPs, means that many homes now have electricity and running water. Local authorities too see a lucrative future in the tourist trade; Rio's favela is perched high on a hill with beautiful views of the city. Residents are now proud of their urban community. Through music and art, dancing, singing and murals painted on buildings in the slum, they display their colorful stories of poverty, hard work and resilience. Donna M. Goldstein challenges much of what we think we know about the "culture of poverty." Drawing on more than a decade of experience in Brazil, Goldstein provides an intimate portrait of everyday life among the women of the favelas, or urban shantytowns. These women have created absurdist and black-humor storytelling practices in the face of trauma and tragedy. Goldstein helps us to understand that such joking and laughter is part of an emotional aesthetic that defines the sense of frustration and anomie endemic to the political and economic desperation of the shantytown. I've used this book in my cultural and medical anthropology classes. Goldstein guides us inside the favela. We learn to care about the people in this shantytown, her friends and their families, and understand the humor they find in incidences that would send most of us to a state of despair. If you want to see (and feel!) the action and the violence, to hear the laughter and pain of life in the favela, rent City of God, directed by Fernando Meirelles. I show this film regularly in my introductory cultural anthropology and sociology classes; it's a visually brilliant movie based on a true story. Watch the trailer above - in my opinion it's one the top films of the last 20 years. Both the book and the film will show you what's behind the scenes, culturally, politically, socially speaking, as we move towards the Olympics of 2016 and perhaps contemplate a visit to Brazil . . . or at least it will help flesh out the 'two minute' exposes of Brazil that network news will pass on as journalism. Patricia Correia Capistrano looks out of the window above a row of shampoo bottles and hair products, scanning the street of Rio de Janeiro's largest shanty town, or favela, Rocinha, for potential customers. Sensing a quiet afternoon, the 28-year-old hairdresser relaxes into conversation. "The government wants to make the favelas safer for tourists because the view up here is amazing," she says, resting her arm on a salon chair. "Everyone here is focused on the World Cup and the Olympics." As Rio gets ready to host the matches in the 2014 World Cup and the Olympics two years later, the city's hillside shanty towns are the target of a government clean-up that in turn is being used as a springboard to develop tourism in the favelas with special tours. Favela tours provide an exciting alternative to Rio's well-known tourism circuit of Sugarloaf Mountain, the Christ the Redeemer statue, and the beach. Built on steep hillside slopes, the favelas have breathtaking views of the city. They also offer a unique glimpse of how some 20% of Rio's population lives, and an insight into Brazil's cultural and musical heritage. "The favela has become part of the Rio postcard," says Eduardo Mielke, a tourism researcher, based at Leeds Metropolitan University in the UK. 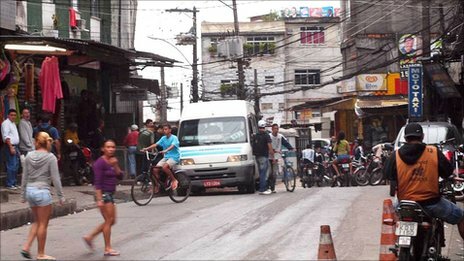 Police presence In the last two years, 13 of Rio's 1,000 or so favelas have seen a permanent police presence, known as the Police Pacification Units (UPP), which aim to drive out the drug traffickers that control the slums. "By 2014, we'll take the UPP to all the communities in the state that are still controlled by criminals," Rio de Janeiro Governor Sergio Cabral said. "It is a new moment for Rio that will give visitors the freedom to get to know the city better." 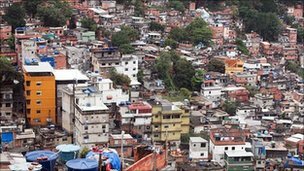 In August, Rio's tourism ministry launched a programme in the Santa Marta favela - the first slum to become part of the UPP project - to train residents to become tour guides. Since the creation of the Rio Top Tour project, the favela once ruled by the city's largest drug gang known as Comando Vermelho (Red Command) has become a tourism hub, with 4,500 visitors in the programme's first month. Street signs in English have been placed throughout the community, and there are now 30 different tourist attractions, including a samba school, a local art gallery, and the spot where the Michael Jackson music video, They Don't Care About Us, was filmed. "Before the UPP came in, Santa Marta was dangerous," says Daniella Greco, who volunteers in the favelas and works with a tourism company. "The community is happy to have the tourists there - when you had [drug] trafficking, tourism didn't happen." 'Pacified' Rio Top Tour is due to be extended to other favelas before the World Cup comes to Rio, although some have already used their own initiative to promote tourism. 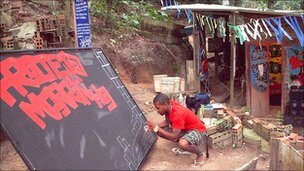 Rocinha is home to some 250,000 people Cilan Oliveira lives in the Pereira da Silva favela, where he works as an artist and a tour guide for Project Morrinho - a 350 sq m (3,800 sq ft) model of the favelas built by local teenagers. "I love showing people this place because they get a better idea of our community," he says. "I say to them, welcome to my community - relax, we are peaceful here." Until now, the violence that plagues the slums has limited their tourist appeal to a few operators that market their tours to adventurous backpackers. But critics say that the government's plan fails to understand the complicated reality of favelas like Rocinha - which is home to some 250,000 people, and has operated outside the reach of the government since migrant workers started flooding into the shanty town in the 1950s. Mr Cabral says the UPP will be brought to Rocinha by 2011, shrugging off concerns of a war between the drug lords and police that could last long after the games end. "In Rocinha, a strategy is being drawn [up] responsibly," he says. "The 'pacified' favelas are a showcase for the government," says Bianca Freire-Medeiros, a sociology professor at the Getulio Vargas Foundation in Rio. "But many are skeptical about how long these supposed benefits will last once the World Cup and the Olympics are over."